Portable speakers have come a long way over the past few years. 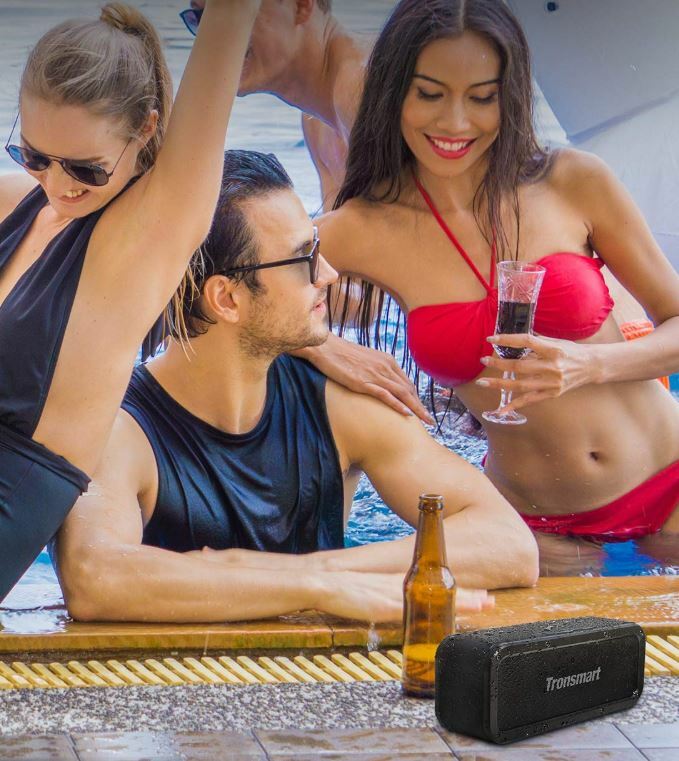 Not only in audio quality, but features that make them more enjoyable such as Bluetooth connectivity. Although in this day and age it seems like there are tens of thousands of different makes, models and styles, it seems to be easier than ever to find a decent speaker at a reasonable price. Take the new Tronsmart Element Force for example. It’s not priced incredibly low, but also not so expensive that it’s hard to justify purchasing. But like any audio equipment, it can seem a bit daunting to blindly order it online without knowing a bit more about it. Today we’re going to take a close look at it, examine its features, limitations and impressive traits. 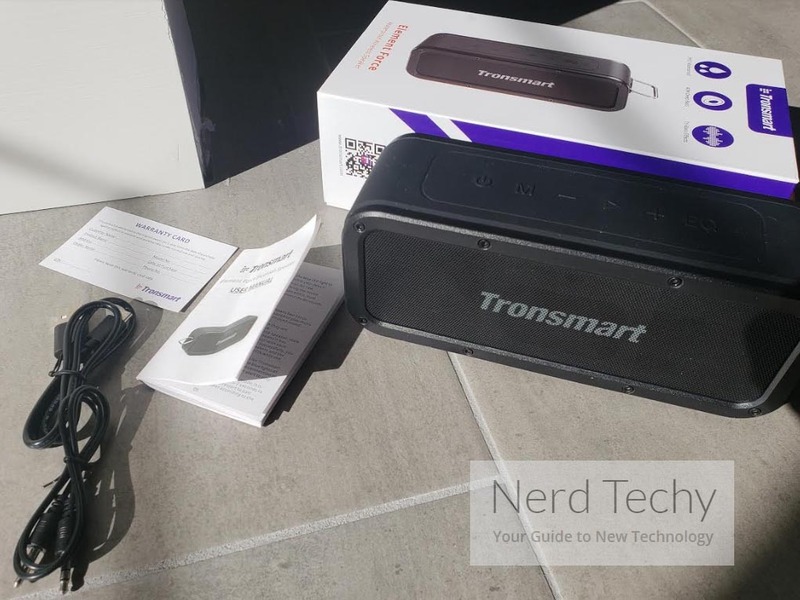 Upon its arrival, the Tronsmart Force comes included with a couple of accessories – a USB Type-C charging cable and an auxiliary cable. In addition, they’ve included a small user manual and a warranty card to help get you started. Pulling the speaker out of the box for the first time, you’ll immediately notice the build quality and size is something to be aware of. Covered in a rubber-like membrane, it feels soft yet durable with a metal grille on each side with “Tronsmart” written in the center. Measuring 7.48 x 2.13 x 2.76 inches, it’s fairly small, but not really small enough for your pocket. Best for a backpack or beach towel in our opinion. On the top, you’ll find all of the essential controls including the power button, mode/Bluetooth button, volume up/down buttons, play/pause/hands-free button and a “tri-bass effects” button. In addition, there are two LED indicators that keep you informed regarding the Bluetooth connection and charging status. On the backside, you can remove a small rubber flap to expose the USB Type-C charging port, micro SD slot, and line-in port. The exterior is pretty basic and to the point, which is what we like to see. Conveniently located, on the right side is a small metal loop that lets you attach the speaker to just about anything you can think of. The freedom of wireless connectivity is something that we all crave when it comes to audio equipment. Being untethered from the tangle of wires is likely one of the main reasons people tend to go the route of Bluetooth. 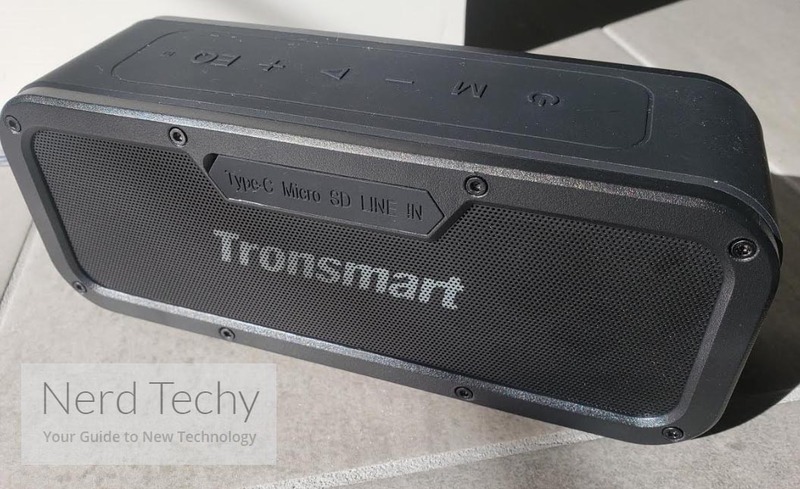 With the Tronsmart Force, they’ve incorporated Bluetooth version 4.2 that upgrades both the stability and range of the wireless transmission over its predecessors, version 4.0. In order to enjoy the wireless feature that the Force offers, you’ll initially need to to go through a minute-long process. First, make sure you have Bluetooth enabled on your device (smartphone, laptop or tablet). Then, turn on the speaker and then wait for the blue LED indicator to flash intermittently. At this time, go to your device’s Bluetooth settings and scan for a new Bluetooth device labeled as “Tronsmart Element Force”. Click it, and it will pair. That’s it! If for any reason you’d like to disconnect from Bluetooth, just hold the mode button for an additional two seconds. Setting up the Bluetooth connection is truly a piece of cake and you should only need to do it one time per device. 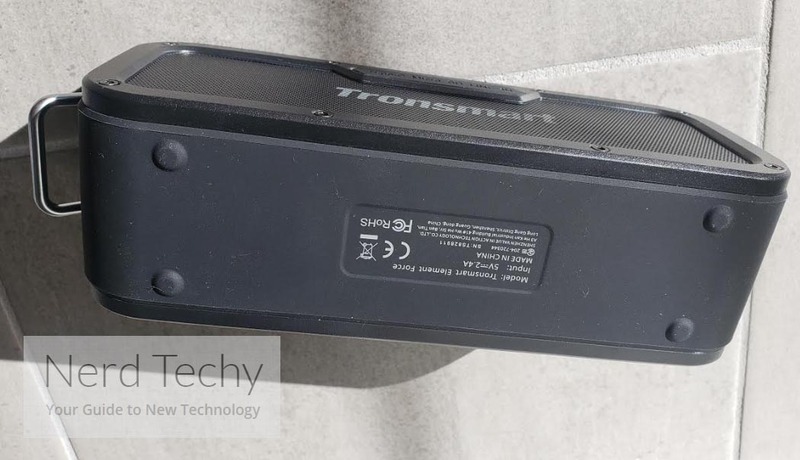 As far as range goes, Tronsmart advertises around 20 meters or 66 feet of connectivity before transmission becomes a problem. This is dependent on how many obstructions are in-between your paired device and the speaker itself. In our experience, we achieved around 55 feet of range before our music became a bit choppy and distorted. This was within line of sight, so if you start putting walls or objects in the way, you shouldn’t expect a full ~60 feet of connectivity. Although the range we achieved wasn’t quite the advertised 66 feet, anything over 40 feet is pretty impressive. Notably because most Bluetooth speakers in this class aren’t capable of more than 10 meters or ~33 feet. One of the best features that we noticed is the TWS Mode. TWS, or True Wireless Stereo, lets you utilize two Force speakers to be paired simultaneously to provide true stereo surround sound for an immersive effect. To enable TWS, confirm that both of the speakers are disconnected and not paired with any device. Then, hold the EQ button (located on the top) for 2 seconds on one speaker. At this time, you’ll hear a voice confirming that the speaker has entered TWS mode. Each speaker will then be automatically paired with each other as you’ll be audibly notified. One speaker should have a solid blue LED indicating the right channel, and the other speaker will be flashing blue. After this, go into your device’s settings and select “Tronsmart Element Force” to pair with it. You’ll now notice that both LEDs (one on each speaker) will glow a solid blue. Once you see solid blue on each speaker, this will indicate that both are ready to go and you can now fully enjoy TWS audio. 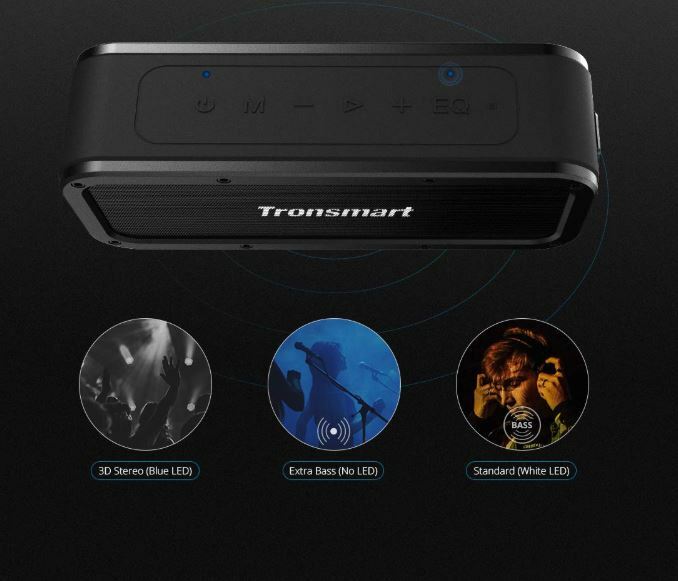 Capable of providing up to 40 watts of sound, don’t let the small size of the Tronsmart Force fool you. These speakers may seem portable and compact, but the sound that comes out is truly impressive. We played multiple kinds of music including rock, pop, classical and R&B – it was difficult to discern any clarity issues between the different genres. Audio was clear, free of fuzziness and sounded like it came out of a name-brand speaker. Even when we cranked the volume to its maximum, the clarity was on-point and we’d say the distortion was less than 1%. Utilizing the “Tri-Bass Effect” you can swap through three different equalizer modes to suit any genre of music that you’re listening to. These modes are labeled as 3D stereo, extra bass and standard. 3D stereo tends to give a very immersive effect that showcases the harmonic tones with making sure the treble and bass is set to the ideal level. Extra Bass mode lets the bass go “all out” and gives way to some of the deepest sounds capable with the Force. And “standard” is pretty self explanatory – it’s the default mode that sounds great and is an all-around good choice for any music. 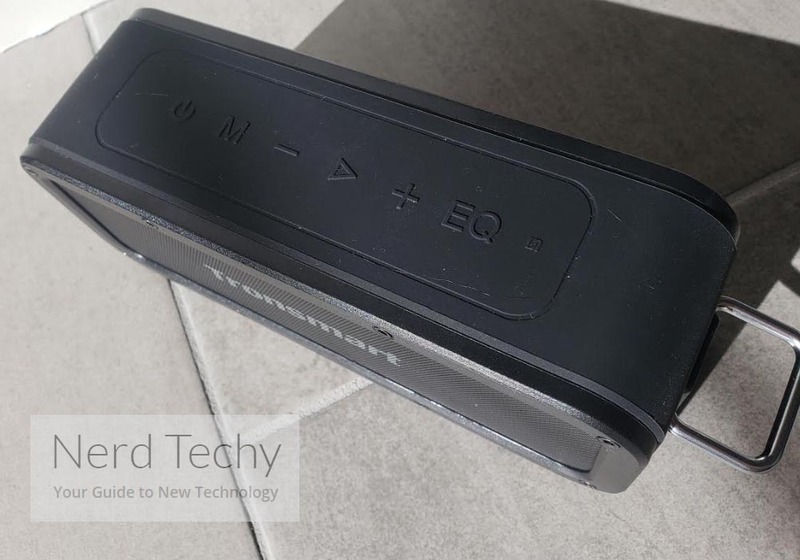 Like any wireless speaker, the internal battery is an important aspect to consider. Without a decent battery, you won’t get very far away from the wires and cords without having to charge it up again. 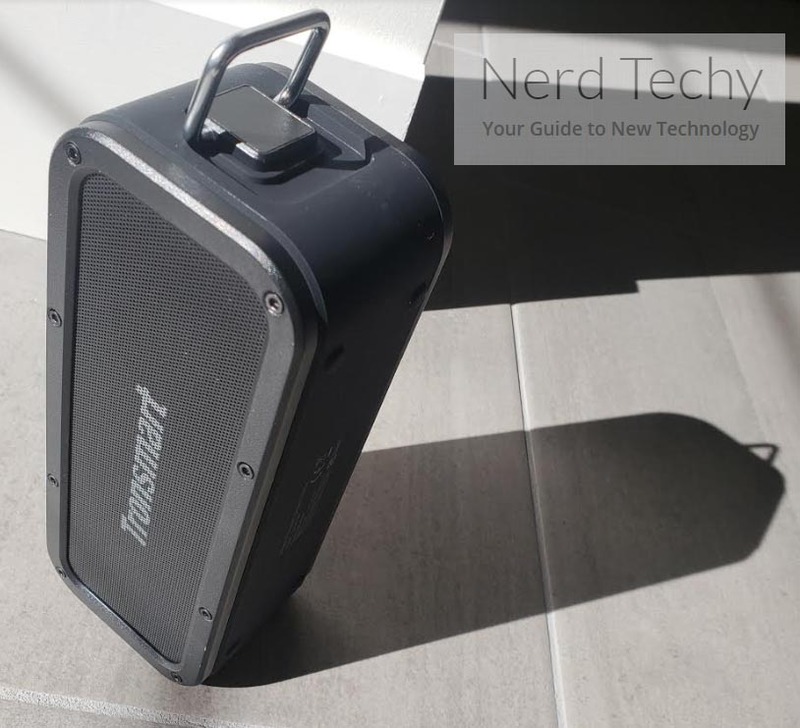 Lucikly, Tronsmart equipped a massive 6600 mAh lithium ion battery into the Force to enable wireless freedom for up to 15 hours straight at a moderate volume. Turn up the volume higher than medium and you can expect around 10 to 12 hours. Turn it to an extremely low volume and you may even exceed the advertised 15 hour battery limit. In our own experience, we achieved around 13-14 hours on average – not far from the estimated 15 hour time-frame that Tronsmart sets. Charging is super easy. With the supplied USB Type-C cable, you can connect the Force into any USB plug or adapter and effortlessly charge it within a matter of 3-4 hours. We recommend keeping the speaker charged up so you can use it to its full potential whenever you’d like. However, we don’t recommend leaving it on the charger for an extended period (multiple days). This may ultimately end up damaging the internal battery and create charging problems down the road. As we said initially, the first thing we noticed about the Tronsmart Force was its rubber-like coating around the exterior. Paired with its solid-feeling construction, this membrane naturally repels water and creates a scratch-free surface all-around. But what’s more is that the speaker is IPX7 rated. 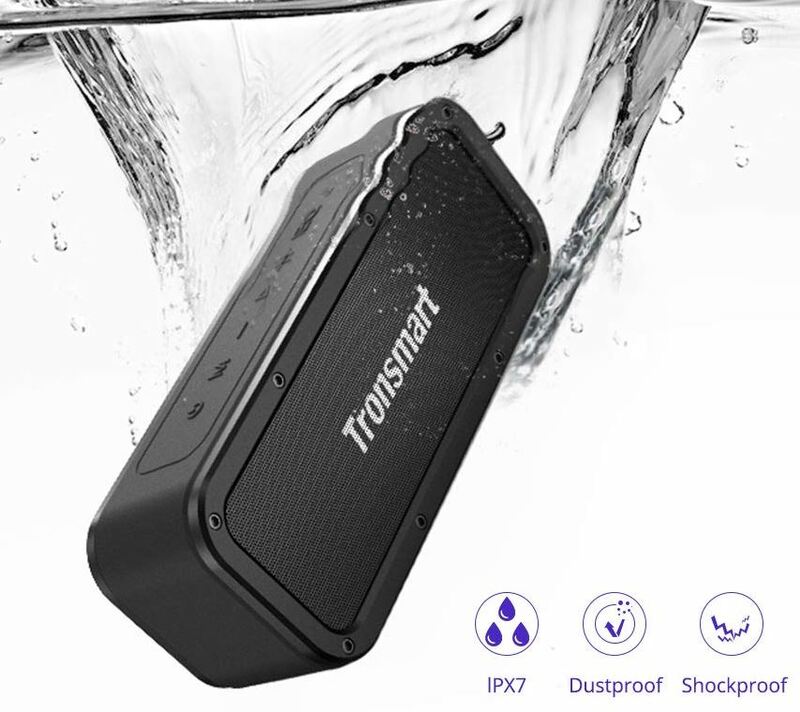 This means that it can withstand water up to 1 meter deep for up to 30 minutes without water penetrating the internals. You can worry-free knowing that you can fully immerse it in water and expose it to the elements without issues. Durability like this means you can literally bring it everywhere besides the depths of a lake or swimming pool. In addition, it’s shock-proof and dust-proof. It’s safe to say it’s built for the outdoors and any adventures you decide to take it on. Priced somewhere in the middle between ultra-cheap low-grade and high-end name brand models, the Tronsmart Element Force is a great choice for anyone looking for a fine balance of quality and value. We love how they’ve designed it to be ultra user-friendly, while not compromising on high-end features that we typically only see with more expensive models. Yes, the audio quality isn’t the same as an audiophile-grade B&O or Bose speaker, but you get so much value with the Force that it’s hard to beat. You’re not paying in excess of $300, but more-so around $50-$60. Most likely, you’ll be impressed as we were with the sound and happy with all of the equalizer modes that help bring out the true effects of your music. As far as durability goes, that’s where we feel it truly shines. Fully submersible in up to 3 feet of water for half an hour is an impressive feat. You’re probably not going to go swimming with it, but you can rest assured knowing that it’s built well for the elements and any outdoor scenario that you put it through. Last but not least, it’s worth mentioning that Tronsmart stands proudly behind the Force by giving a 100% satisfaction guarantee with a 30 day return period. There’s even a 12-month warranty period should you ever run into any issues with it over the course of time.